The globalisation of the world economy poses significant challenges for policy makers, regulators and legal professionals. The Asian and Brazilian financial crises have shown that difficulties in the banking sectors of some economies can have serious repercussions across world financial markets. It is clear that a sound legal infrastructure is crucial to promote financial stability in this global market. Particularly in the case of international bank failures, the need for harmonised and effective international insolvency procedures is becoming increasingly apparent. It is against this background that the Bank for International Settlements organised a workshop on International Bank Insolvencies in the summer of 1998. 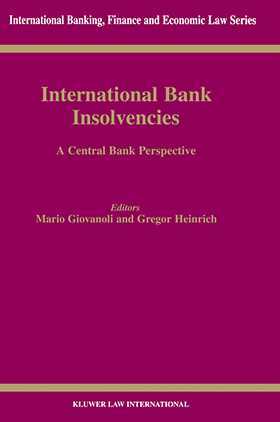 This unique book presents the edited workshop papers by expert lawyers from over twenty national central banks, the European Central Bank, the Basle Committee on Banking Supervision and the UN Commission on International Trade Law. Nineteen country reports provide a comprehensive overview of central banks and other institutions responsible for banking supervision and the co-ordination between authorities involved in insolvency procedures. The authors further discuss the instruments employed for crisis prevention and resolution and issues arising in the aftermath of a bank failure in the respective jurisdictions. In addition, twelve expert papers discuss issues ranging from specific national experiences to attempts at co-operation and harmonisation at regional and international level. The book further includes in an annex the text of the UNCITRAL Model Law on Cross-Border Insolvency and the EC Finality Directive.